Custom Compact Springs Designed to Support a Storage Tank | Piping Technology & Products, Inc. 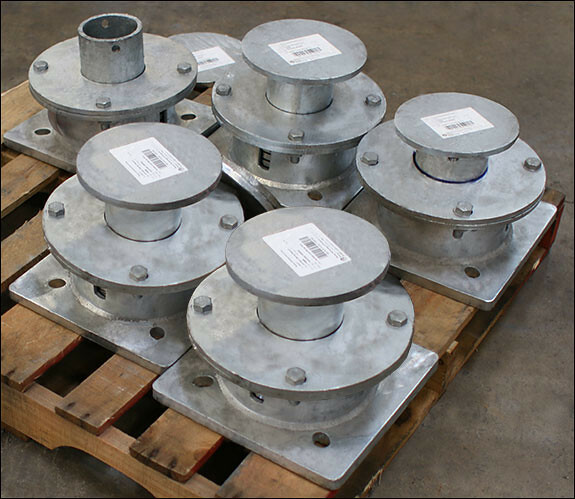 These compact spring supports were custom designed to support a storage tank at a facility in Texas. The housing was fabricated from A-36 carbon steel and hot-dipped galvanized to protect them against corrosion. The disc springs are engineered using the stainless steel Belleville disc springs designed for large loads but small movements. In this case, the springs are designed to support a load of 5,000 lb. and movement of 0.25″ (upward). Each assembly underwent load testing prior to shipment.